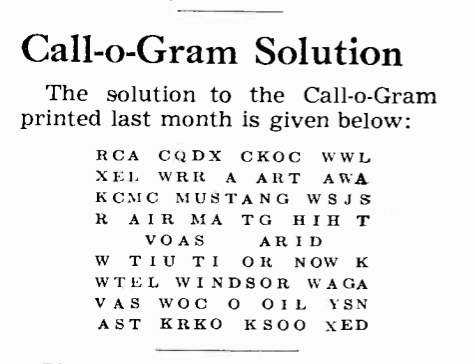 In the 1930s Radio Index began a bi-monthly series of radio-themed crossword puzzles they branded a "Call-o-Gram." Instead of the NY Times full array of topics and categories, they focused on call letters (of course) but also technical minutia, past and present station lore, across both the AM and Shortwave bands. 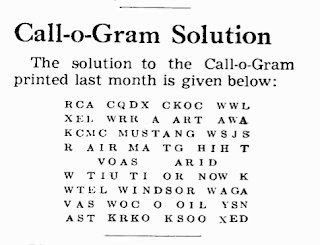 Radio Index published puzzles of various kinds in different issues but the Call-o-Gram only lasted for a few issued in 1937 and 1938. I am assuming the series was discontinued because the questions were more arcane than this blog. I recognize none of the names, but some of them became life-long radio men. Edward Ayvazian (WF314) was the editor of a zine in 1938 called The Radio Listener. [SOURCE] The Radio Listener was basically a list of foreign Long wave and Medium wave stations. He "published" it in 1938 and 1939. He also reported QSL data to All Wave Radio Magazine the same year. Raymond C. Corbett was based on Sacramento, CA. He wrote in to Radio Index as early as March of 1935 to report his DX. He was receiving stations up to 2,00 miles away, even some from Australia and Japan. Lloyd J. French is probably the same fellow in West Hartford, CT who was a member of The Pioneer Days, a radio club who published a zine. from 1966 through 1982. [SOURCE] He also wrote in to the same DX section of Radio Index as early as November of 1934. He described, among other things, his reception of pre-WWII French radio broadcasts.